The genus Solanum has a near-cosmopolitan distribution and furnishes a wide range of relatives of some of the world’s most important crops. The potato is the fourth most important crop globally. 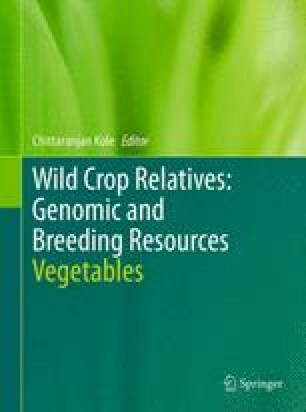 Other crops in the genus include the tomato, the subject of another chapter in this volume, eggplant or aubergine, the Ethiopian eggplant, and a number of other minor berry and leafy vegetable species. These species have origins in both the New and Old Worlds. Both climate change and land-use changes are threatening some of the wild relatives of these crops and estimates have been made for the relatives of potato in the Andes, which suggest that approximately 10% of species may go extinct by 2055 if they cannot migrate at a sufficient rate. However, wild potatoes were early subjects for plant collectors, and they are now well-represented in gene banks globally unlike the relatives of Solanum crops other than potato and tomato. Particularly in potato, these wild relatives have been used extensively in breeding through sexual means and also used to determine which species gave rise to the crop and, therefore, where this domestication took place. More direct routes to access and transfer pest and disease resistance in this crop are underway. The genome of the potato has now been fully sequenced, and additional effort in its wild relatives may now be expected. There is a great deal of potential in the genus particularly for the identification of bioactive compounds for novel medicines.